Decorative Frames. 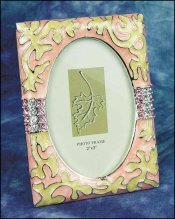 2 x 3 Peach Enamel Frame  - $9.50 : Yarn Tree, Your wholesale source for cross stitch supplies. Item 4548. Elegant peach and ivory enamel swirls are accented with pink and clear crystal bands. Design area is 1¾" x 2 5/8". An easel back allows the frame to be displayed either vertically or horizontally. Individually boxed.